FREETOWN, Nov 6 2014 (IPS) - The fight against the deadly Ebola epidemic ravaging West Africa seems to be hanging in the balance as Sierra Leone’s Minister of Health and Sanitation Dr Abubakar Fofana told IPS that the government is overwhelmed by the outbreak. “We were not prepared for this Ebola scourge. It took us by surprise and with our weak health system, we can only rely on support given to us by our international partners,” he told IPS. 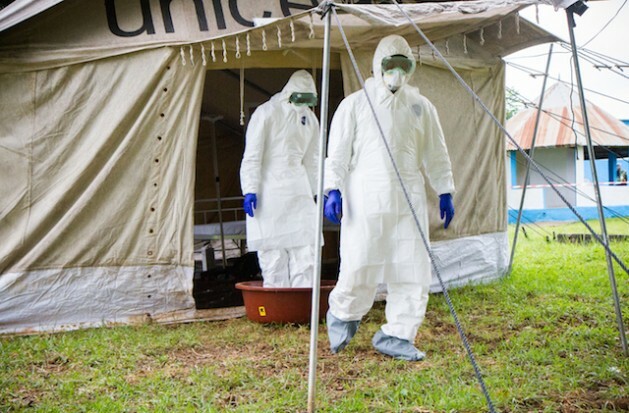 “There is a huge gap in all aspects of the response, including medical care, training of health staff, infection control, contact tracing, epidemiological surveillance, alert and referral systems, community education and mobilisation,” MSF says. Many attribute the rapid spread of the Ebola virus to people’s attitudes and, as MSF says, a lack of sufficient community education and mobilisation. Cultural practices and traditional beliefs are also greatly hampering the fight against Ebola. “Our people still continue to touch, wash and bury their dead. This is an easy way to get infected, even though they have been told repeatedly not to do so,” the chairman of the National Ebola Response Committee, Alfred Palor Conteh, told IPS. Ignorance and ingrained traditional cultural beliefs are terrific obstacles to overcome. It will take a very long time and an eclectic culturally sensitive approach to make even minor gains in acceptance of foreign health care workers trying to impact the myths often opposed by traditional healers and to eventually develop and win over the trust of the populace. In my experience, involving the communities’ leading respected citizens is often the key to success. By involving the very populace affected in the treatment regimen will often open the door to acceptance of new ideas by the rest of the community. It’s not foolproof, but it’s a start.